Vacation Rental Waikiki Honolulu Hawaii ~ Free Parking ~ From $795 week. Gary’s Place is not a hotel and not on the beach, no surprises here. High 30th floor with FREE wifi, local calls, and FREE parking! LOCATION: Located at the intersection of Kuhio and Royal Hawaiian Avenues. This places you at the hub of Waikiki. The beach is a short walk, bus service in front of the building, several convenience stores within ½ block, tourist shopping within 1 block, super market short blocks, International Market Place is 3 short blocks. Walk, ride, or drive you are in the right place. THE BUILDING: The Royal Kuhio is 38 stories tall and has a number of preferred amenities. Entering the beautiful lobby you will notice the security station and 'keyed' access doors to the elevator lobbies. The 7th floor boasts a number of options. You can simply sun bathe, or avail yourself of the pool, exercise room, saunas, or putting green. To keep the kids occupied the 7th floor also offers ping pong, billards, paddle tennis, and ½ court basketball. Both charcoal and gas BBQ’s are available. A large covered carpeted open air lanai is available for your enjoyment. Just in case you need to wash a few clothes the 7th floor coin operated laundry has more than 20 washing and drying machines. In building reserved parking is included at no extra charge. THE CONDO: Gary’s place is privately owned and non smoking. It is located on the 30th floor of the building facing the quiet and serene Ala Wai, golf course, and the mountains. The condo is designed to offer the client a wide range of choices. For example, the full kitchen permits you the choice of full meal preparation, light meals, snacks, or just cold drinks. Temperature comfort: open the lanai door and feel the breeze, or turn on the ceiling fan, or for those that like it simply cold close the door and “crank up” the A/C. BATHING OPTIONS: The combination tub shower allows you to choose either a soothing “soak” in the tub or a refreshing shower ranging from very cool to steaming hot. ENTERTAINMENT: A 32" flat screen remote control cable T.V A combination radio/CD player, A combination VHS/DVD player. Or perhaps just the quiet and a good book. Also, for the home video folks the T.V. is capable of viewing your camcorder via cables or “S” plug-in. SLEEPING OPTIONS: The condo is equipped with a king size bed and a queen sleeper couch. COMMUNICATIONS EQUIPMENT : FREE high speed internet. WIFI. or ethernet. FREE unlimited local calls. The phone is direct dial long distance and international call capable with credit or phone cards. THE KITCHEN: Just in case 'eating-in' is your preferred option the kitchen is well stocked with dishes, pots and pans, casserole baking dishes, blender, waffle maker, rice cooker, crock pot, toaster and coffee maker. The fridge is a full sized 18 cubic feet, 4 burner stove with oven and broiler, microwave, and of course a dishwasher. ANALYSIS: Gary’s place is centrally located; offers many choices, provides vacation value; the building has excellent facilities, is well maintained, and offers 24/7 security. I hope to hear from you soon concerning a reservation, but if you find another better suited value for your vacation I wish you a wonderful time in Hawaii, a place that I fell in love with many years ago. Bathtub/Shower combination with separate dressing room. Two short blocks to Famous Waikiki Beach. Beautiful views of the mountains, and the Ala Wai public golf course. High 30th floor view of Ala Wai golf course and the mountains. This is the cooler and most quiet side. All local calls on Oahu are FREE. You can receive in coming calls from other countries. Window unit. Ceiling fan plus portable tower fan. 30 plus coin operated washers and dryers. 30 plus coin operated washers and dryers..
Free reserved in-building parking is included at no extra fee. Dedicated in unit WiFi. Separate WiFi on 7th floor recreation deck. Yes + beach towels too! The exercise room is rather small with older modest equipment. See attached photo. 5 elevators total. 3 elevators service lobby to 31st floor. 2 other elevators service floors 32-38 only from the lobby. Queen sized sleeper coach. Very comfortable couch plus single setting chair. Full size. Dishwashing soap provided. 19 cubic inch combination freezer & refrigerator. Ice trays provided. Full size electric stove. 4 top burners with lower oven/broiler. Combination electric stove/oven - full size 4 burner top. Kitchen top automatic drip coffee maker. Filter provided. Kitchen tops 2 slice toaster. Multiple setting plus will accept 'wide' bread such as bagels. Not just 4 forks, 4 knives etc. Plenty of flat ware. Full sized fridge, 4 burner stove top with full size oven, dishwasher, garbage disposal, ample plate and flatware, and wide range of pots, pans. Crockpot, coffee pot, and blender. Plus assorted gadgets. 30' interior round glass table top seating for 4. My favorite, 30 inch circular glass top rattan table, with seating for 2 on the lanai. Rattan table is standard height! 32' flat screen on swivel table top. Cable provided by Hawaiian Tel. Ping pong table and 2 coin operated pool tables. Beautiful views from the 30th floor. Set-up as 2nd eating area. Beach chairs, beach umbrella, and cooler. 4 large beach towels provided. Paddle tennis court on 7th floor. Separate sauna's for men and woman. The Pool is closed for renewal. Effected Dates: 2/5/19 - 5/31/19. Daily published rates have been discounted. Nice accommodations. Nice view. Good location. Could have used a second key. Would recommend. We had a wonderful time in Hawaii and even better was the accommodation available at Gary's Place. Location was excellent, right across the street from McDonald's and a block away our favourite Udon place. Gary's Place has everything you need for a family of 3-4. Kitchen is stocked with what you need to make your own food and there was some water equipment along with chairs you could use on the beach. I would recommend this place to anyone that wants to have a great place to stay at a good price while travelling to Hawaii. Oh yes, free parking is always a bonus as it's hard to park for free near Waikiki. We loved Gary's Place and will definitely be going back next time we are in Honolulu. Thanks for everything Gary. We stayed a week at Gary's. The location cannot be beat for this location. The apartment had everything you need: full kitchen, lots of (fluffy) towels, beach towels, comfy bed, PARKING!!! The host is very responsive. We had a clogged shower and the host immediately called for repair. Overall, very comfortable for 2-3. From the welcoming lobby, to the aloha decor, this unit was perfect for me. The location is great, with the bus stop out front, the two block walk to the beach, and the thoughtful amenities in the unit. From the beach towels, to the vases above the fridge, Gary has it all ready for your island stay! The 7th floor facilities are a hidden gem, as I could sit in the shade, or swim in the sun in the pool while I did my laundry, and the breezes remind you that you really are in paradise! I will be back, but not soon enough. Thank you for sharing your Hawaiian hideout! So very glad you had a grand stay in Hawaii! "The Bus" offers a very nice alternative to car rental, and with the "stop" in front of the Condo a huge plus. your stay at Gary's Place exceeded your expectations! Looking forward to seeing you in the again in the future! 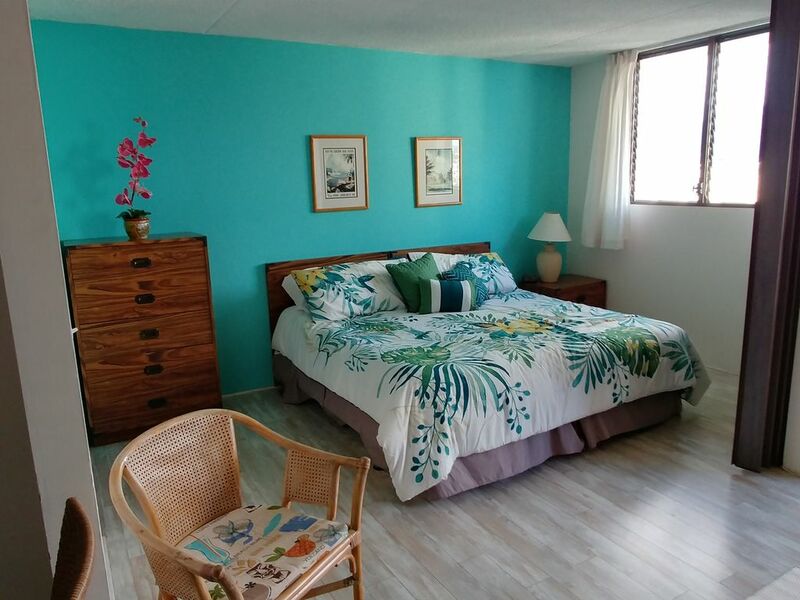 The condo is the perfect place to stay if you want to be in the center of Waikiki and be able to walk everywhere. The canal view is beautiful at night and is a bit more quiet than facing Kuhio Street (there is no escaping all traffic noise in Waikiki) . We never heard our neighbors either. The free parking is probably the biggest benefit. The condo is small, but works for 2 people - I wouldn’t be able to do it with 4 adults. We had 2 large suitcases and 2 large travel golf bags and it was a challenge finding space to store them, but we made it work. The 7th floor is a nice area and the washateria area is large. Gary also provides everything you need for a day at the beach. We had a lovely stay at Aloha Gary’s place! I highly recommend the apartment. It had a LOT to offer that other places do not have. Gary has a fully stocked kitchen. Two years ago we stayed at a place that didn’t even have a cutting board. So I travel w two pans, cutting board and some knives just in case. Well, u won’t need to bring if u stay at Gary’s. It even had a nice J.A. Henckles knife to mince my fresh herbs. And Yes, he even has a waffle maker. The oven works great as well. He has boogie boards, cooler, ice packs in freezer, chairs, umbrella. I could go on and on about the pros of this place. Plenty of closet and drawer space, even hangers. The A/C was going on and off (maybe we just didnt push the right buttons). But the ceiling and tower fans kept us plenty comfortable. Loved the Lanai and really appreciated the clothes drying rack. It’s listed as a one bedroom, but it’s more like an alcove studio w a sliding wall to separate. If you like darkness when you sleep, I would recommend a sleep mask. The drapes are not black out curtains. Laundry facilities are coin operated. Bonus that there is a little play area w slide for our son to play on while I did laundry. My husband and son enjoyed some time in the pool, but it was much too cold for me to go swimming in. Not heated, don’t even ask. Convenient location. Clean, no bugs. Would stay again if we came back to Waikīkī in the future. Mahalo, a hui hou! Sunday morning travel presentation by local travel agent including continental breakfast, golf tennis, riding, museusm, surfing and the BEST, people watching! International Language School 3 blocks away on Kalakau St.
In-building reserved parking included. FREE Late PM check-out, for late evening flights, available at time of booking, for an additional rate of $70.00 includes tax. Early AM arrival check-in possible at time of booking if available. Additional rate is $70.00 includes tax. ~ No baggage storage is available. ~ 28 day Month. All monthly rates are based on a 28 day month.